"This is a wonderful, slightly creamy egg dish. The chopped parsley gives it tons of great color! If you can't find creme fraiche in your grocery store, just combine 1 tablespoon of buttermilk with 1 cup heavy whipping cream. Stir together and pour into a jar. Very lightly screw the lid on and let sit for 5 to 8 hours. This it can be refrigerated for 10 to 14 days." Beat eggs in a bowl with an electric mixer until thick and frothy, 1 to 2 minutes. Fold in parsley, black pepper, salt, and white pepper. Melt butter and olive oil together in a nonstick skillet over medium heat; reduce heat to low. Cook and stir egg mixture in hot butter and oil until eggs begin to set, about 1 minute. Stir in 1 tablespoon creme fraiche; cook and stir until eggs are set, 2 to 3 minutes more. Transfer to a plate and garnish with remaining creme fraiche. 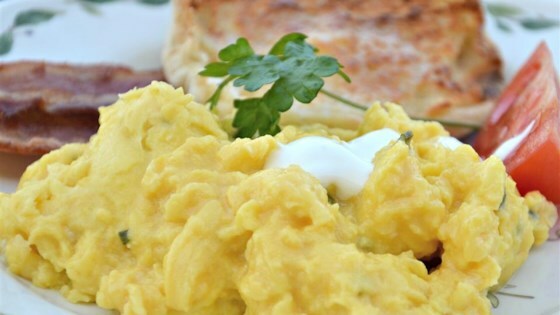 See how to make perfect fluffy scrambled eggs. This was very tasty, but I did feel that 3 tablespoons of fat was a bit much, so I halved it and it was still very creamy & rich. I definitely will make this again! Very good. I eliminated the salt and it was still just fine!